First place artwork is ‘Symphony (requiem) 2016’ by Danie Mellor valued at $14,000, second place is artwork ‘Earth, Wind, Fire and Water’ by Bronwyn Bancroft valued at $1,800, and third place ‘Untitled 4 (Salt Shed Series) by Trevor Richards valued at $900. This photographic work by Danie Mellor explores the sensuality of landscape and nature. 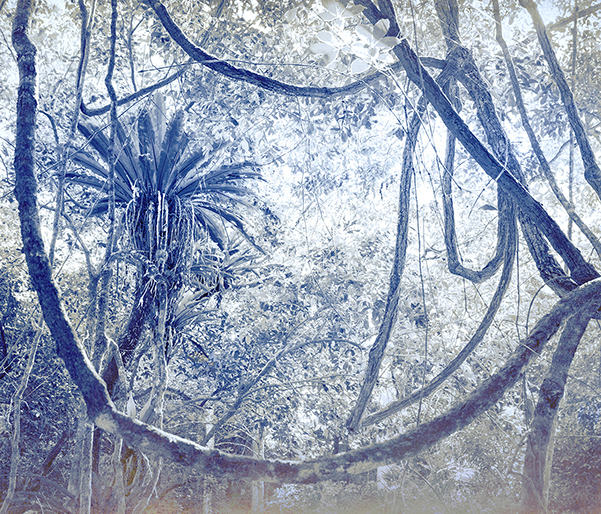 The rainforest holds a particular fascination for the artist, with its complex ecology a potent metaphor for the ongoing cycles of life we experience. It is a dynamic environment for the exploration of the Aboriginal and Australian landspace, with a rich cultural and historical backdrop that reveals the beauty of our country. Danie Mellor is a contemporary artist whose work explores themes that are critically linked to cultural histories and concepts of the landscape. His multi-award winning work is shown internationally and within Australia, and is held in the permanent collections of major institutions and private collectors. Danie’s works are held in the collections of the National Gallery of Australia, QAGOMA, University of Queensland Art Museum, Cairns Art Gallery, Shepparton Art gallery, and Museum of Brisbane. Limited Edition Print on German rag paper. Edition 2 of 20. The inspiration is nature and my artistic acknowledgement of the force of Mother Earth and her abundance. To be cherished! Not trashed! Completed in 2019 in Bundjalung Country. 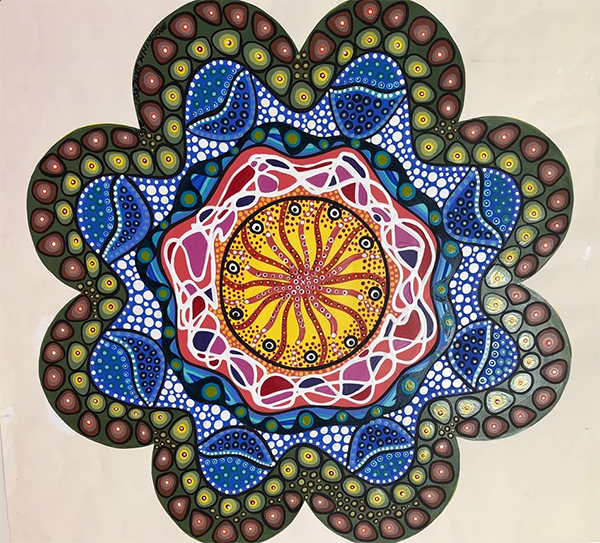 Bronwyn Bancroft is a proud Bundjalung Woman and Artist. Bronwyn has been exhibiting nationally and internationally for over 3 decades. Bronwyn has illustrated and/or written 40 children’s books. Bronwyn has been a Director of her own company, Designer Aboriginals Pty Ltd since 1985. Bronwyn holds positions in the following organisations, Arts Law (Director), Australian Indigenous Mentoring Experience (Director) and Commonwealth Bank Indigenous Advisory Council. Bronwyn has been a volunteer senior strategist at Boomalli Aboriginal Artists Co-operative since 2009. 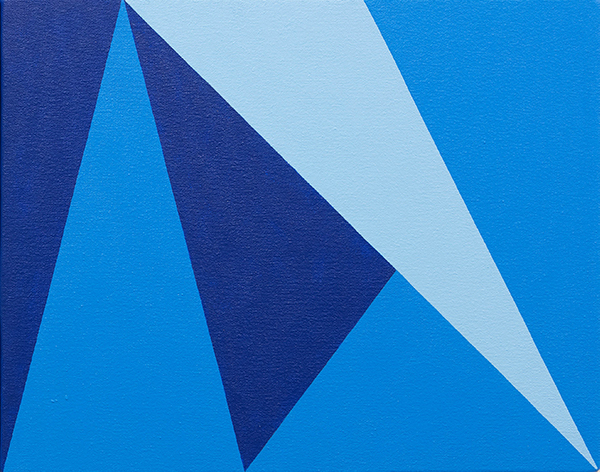 Fremantle based artist Trevor Richards' studio practice includes hard-edge abstract paintings and three-dimensional wall-mounted works that explore bold colour, geometric shape and pattern. He draws on a wide range of historic and contemporary sources, including Islamic and mosaic tile patterning, architectural modelling, tessellations. He combines all within a minimalist, concrete art aesthetic which reflects an interest in the play of built structures in everyday life. He has adapted his studio practice into public and gallery spaces, incorporating floors, walls, windows and roads as surfaces on which to apply pattern and colour. This is a great opportunity to own a stunning artwork created by renowned artists while also helping Arts Law continue to advocate for and provide legal assistance to artists around the country. Tickets are $50 each or $125 for three tickets and put you in the running to win one of three beautiful hand-picked and ethically sourced artworks. The raffle will be drawn on 30 April 2019 at the conclusion of the Arts Law Pro Bono Awards. If winners are not present on the night they will be notified by email. Results will be published on our website.